Bijou - A gem of a little salon in Skaneateles: What the Bijou girls do outside of work...and how Gourmet make and take saved our family dinners! What the Bijou girls do outside of work...and how Gourmet make and take saved our family dinners! Here are my boys, getting started in the kitchen, chopping, cutting and cleaning, before everyone else came! A special treat for sure...Thanks Meg! Here are the first arrivals, look, it's Kimberlee and her little dino..."T" rex! 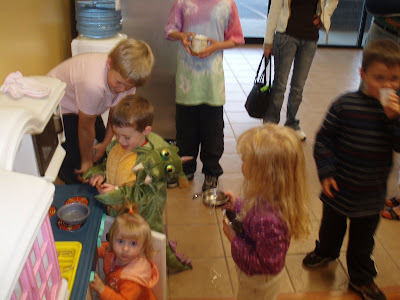 All the kids are meeting eachother, it's a fun place to be, a little kitchen in gourmet make and take, was a huge hit!! 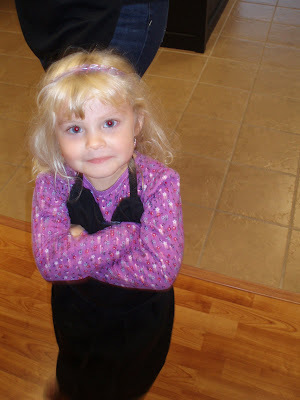 Here is Lori's little spit fire "D", she's "4, ya know?!?!" 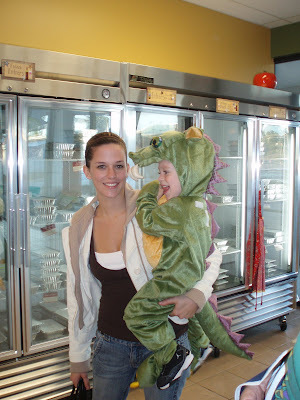 Courtney and her little guy "C", and look "T" rex is swiping a taste...mmm, he said! 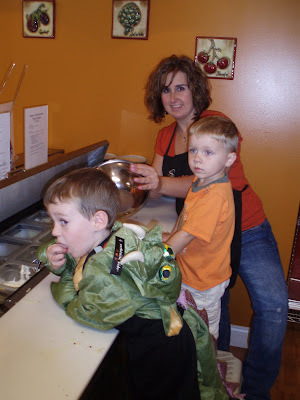 Here is Courtney and her whole little family, making calzones! Here is what we do, you'll see its really easy and so value packed, effecting your time and wallet! We go to every Sunday around noon, we make (or you can get them already pre-made in the fridge) 4-6 meals and normally we make the serving that is for 4-6 people, that feeds the 4 of us for 2 days in a row! What I do is take them home Sunday, cook them all, and we eat leftovers all week, this cuts down on cooking time for us, (we don't mind leftovers, some people may not like this way, normal cooking time is from 35-45 minutes for most dishes) On occasion, I will like a lot of the meals and be indecisive, not able to make a decision and I will choose the smaller servings (2-3 servings) and buy 7 or so of them and put them in the freezer, taking them out each day and having my oldest son pop it in the oven before I come home. However you make it work, let me tell you it works. I have seen a huge difference/CUT in my grocery bill!! AND I have cut back on wasting food (my biggest problem) I now go to GOURMET MAKE AND TAKE once a week, and the grocery store for breakfast and lunch items. I hated when I would make a recipe at home go to the grocery store, have to buy every ingredient, only have to use half of a pepper, when really I was only going to cook one day, and it would kill me, but inevitably that pepper would go to waste. Now let me tell you how else GOURMET MAKE AND TAKE WORKS! Want to get out with friends, sip some wine, yet still be a productive Mom? 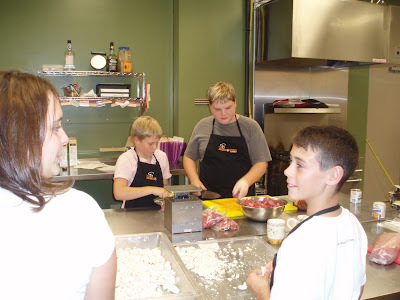 GOURMET MAKE AND TAKE will host parties for you and your friends at no extra cost, you can BYOB/W and friends, cook meals for your family, enjoy friends, even bring your kids with to help. Meg and her girls will cook some things to sample, and help you with anything you need! This is what the pictures are from, me and the girls and their families met at GOURMET MAKE AND TAKE, cooked some meals and got to enjoy ourselves outside of work! Everyone was so surprised at how easy and great things were. I get that, before I ever went there (Kimberlee gave me a gift certificate for Christmas for there) I thought there must be some catch, like maybe the food wasn't fresh or it was already prepared meats or something, BUT the first time I went and saw Meg and her 6 (yep I said 6! young boys in the back chopping, cutting, and cleaning meats, I was SO excited and knew we would be back every week!!! This is the real stuff people, you can't get a deal better than this!! Okay, now lets get to the food! This week we made Aussie chicken, a honey mustard sauce, with bacon, mushrooms and cheese, bake it for 30 minutes and its awesome! I made chicken enchilada's that were the best way to make them, mix shredded chicken (I got my chicken freshly shredded by one of Meg's boys:) tomato sauce, sour cream, peppers, onions, and lots of other stuff, and roll the tortillas in a row and pour the remaining sauce over them....mmm to die for! I made pork chops with an apple and pecan topping and a really awesome meatloaf, that Lori's little girl helped me with!! Here is what the menu this month looks like. Another thing, I have also learned so many recipes from them, and learned to prepare things differently, they are always SO accommodating letting me add extra veggies in a meal from other stations if the recipe doesn't have enough in it!! You just can't go wrong and let me tell you, the first time you try it, you'll understand why I'm standing so tall on my soap box for them, this could really bring back sit down dinners with families, instead of eating on the fly, not together, we need to sit down and talk! Mom's these days are not like our Mom's, who stayed home and cooked all day. Most of us work, and this is a great thing for everyone, those who don't prefer to cook or know how, those of us who are lacking time, those who can't think of new things to make, it fits everyone! NOW GET OUT THERE AND GO TO GOURMET MAKE AND TAKE IN AUBURN, RIGHT ACROSS FROM DENNY'S ON THE SAME SIDE AT MARSHALL'S! You won't be sorry! Click on all the highlighted links above, they will take you to information about Meg's place, and if you come on Sunday, around noon, you too can be her Sunday people:) Seriously, come!! We'll be there! It's really a fun family activity and you kill two birds with one stone, cooking and having fun! What more could you ask for!! !